Hyperopia is a common refractive error, also known as farsightedness. Farsighted people see things best when they are very far away but have trouble seeing things that are closer. Hyperopia occurs when light entering the eye comes into focus behind the retina instead of precisely on the retina. This can be caused by a cornea that is too flat, by an eye that is too short, or by a combination of both problems. People with mild hyperopia can still see things that are far away, but people with severe hyperopia can have trouble seeing clearly, even at a distance. In addition, hyperopia often becomes worse as the eyes lose focusing power with age. 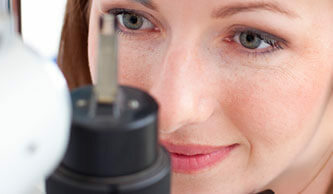 Hyperopia, or farsightedness, can be diagnosed easily by your eye care professional. Treatments for hyperopia are designed to change the way that light rays are bent when they enter the eye so that they come into a point of focus precisely on the retina. 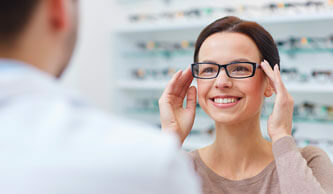 These treatments may include prescription eyeglasses or contact lenses that compensate for the eye’s inability to focus. Another treatment option is refractive surgery, where the cornea is reshaped to change the way it bends entering light rays. Hyperopia can also be treated by implanting a prescription lens inside the eye where it works with the rest of the eye’s natural focusing system to refocus light rays precisely on the retina. When hyperopia causes blurry vision, these treatments may help restore clearer vision, making daily activities much easier.